Daily participation is a key goal. If you want to set a reminder, here are some options. Go to calendar on your phone. 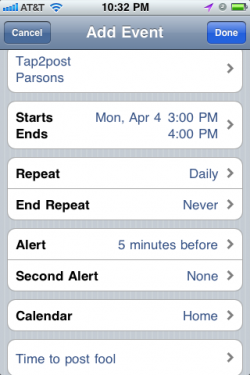 Set up a daily event and reminder. My reminder is set for 3pm, see my settings pic. I’m making you a paper bookmark for your moleskine, notebook, iPad, alarm clock, etc. Somewhere you look daily. Decide on something you do every day and post then, like at lunch or when you’re waking up. I’m making posters for school and flyers and stuff, if some marketing helps. I can set up a text or email reminder, but those just add up as unwanted junk spam, so I think not.